The business environment is highly competitive among the different distribution networks, reinforced by the increasing market share of online retailers. According to the research institute GfK, consumer electronics sales decreased in 2017, mainly impacted by a decline in TV sales (a 31% drop in volume and 20% in value). However, the TV segment had recorded a 30% increase in volume in 2016, driven by a change to TNT HD and the 2016 UEFA EURO Football Championship. Another reason for the decrease was subdued consumer sentiment in H1 of 2017 ahead of the French presidential elections. According to Gifam (the French association of household appliances manufacturers), sales of large household appliances increased 3.6% in 2017 to EUR 5.4 billion. Sales of small household appliances also increased 5% to EUR 3.5 billion, continuing their upward trend for the tenth consecutive year. The French furniture industry research organisation IPEA stated that the French furniture market grew 2% in 2017, in line with a rebound in the housing market. The kitchen segment, which accounts for 26% of the furniture sector, was the main contributor to growth. 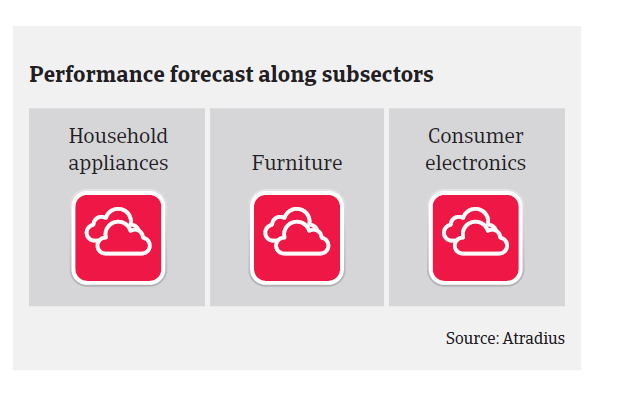 The 2018 outlook for consumer durables seems to be benign. Household appliances and furniture sales are expected to grow further, the latter supported by a dynamic real estate market. In the consumer electronics segment TV sales are expected to rebound (up 2%), driven by the summer 2018 FIFA World Cup. The consumer durables retail business environment is highly competitive among the different distribution networks. This fierce competition has been reinforced in recent years by the increasing market share of online retailers, which have generated significant pressure on sales prices and profitability, especially affecting independent and local retailers. In 2017 the profitability of many retailers decreased, and in 2018 no significant rebound is expected, despite growing sales. In order to adapt to the more difficult market conditions – and in response to the challenge by online retailers - the main players further develop their cross channel strategies and online sales. At the same time, the concentration process through acquisitions or purchasing alliances is ongoing. 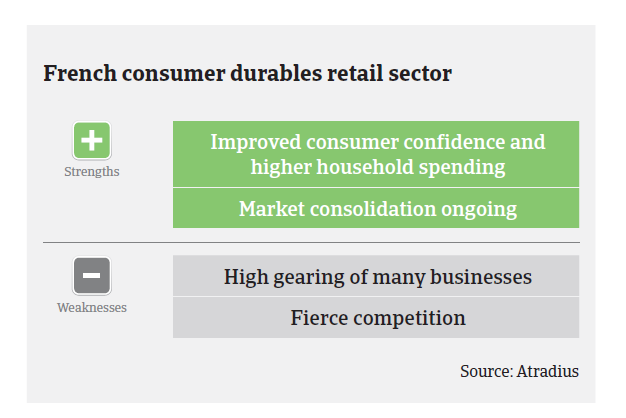 In general the gearing of consumer durables retailers is rather high, given their need to finance working capital requirements and inventories. Moreover, there are peak seasons and special events which temporarily require additional pre-financing. Loans are also required to finance the opening of new stores in order to extend geographical presence. Banks are principally not restrictive to lending to the sector, but their willingness mainly depends on individual retailers´ creditworthiness. Payments in the industry take 45 days on average. 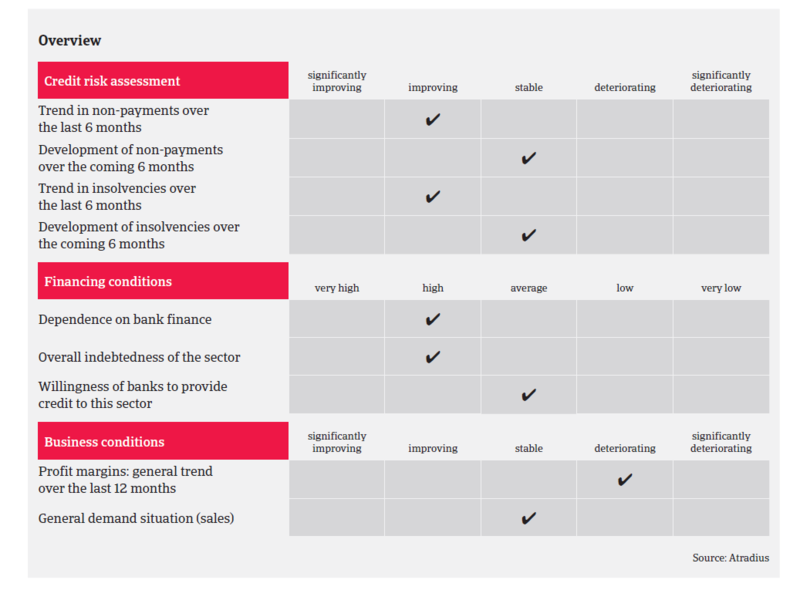 The current level of non-payment notifications is rather low, and payment delays are not expected to increase in 2018, given further sector growth. 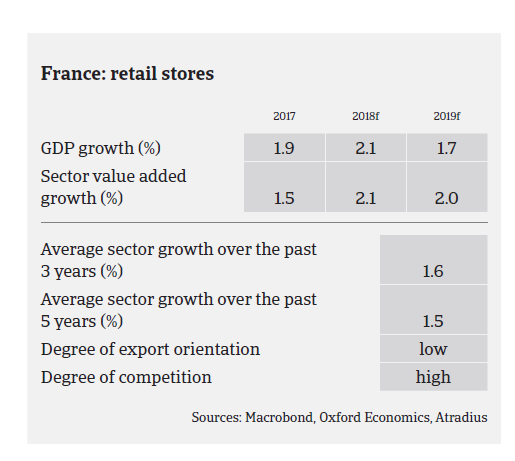 Non-food retail insolvencies decreased 5% in 2017, and while French business insolvencies are forecast to decrease another 7% in 2018, it is expected that non-food retail business failures will level off this year. Given the competitive and volatile market environment there is always the risk that several players fail, especially independent and smaller ones. At the same time, sudden and unexpected defaults of major players cannot be ruled out in this industry. In general, our underwriting stance for the consumer durables retail sector is neutral. Our underwriting approach is rather open for major players, while we remain cautious with small independent players, as several of them have been affected by decreasing revenues and margins over the past couple of years. Larger retailers also require constant monitoring, due to increased financial exposure after acquisitions and higher gearing ahead of peak sales seasons. In general we focus on individual buyers´ resilience in a very competitive market environment, the quality of product-mix and distribution channels and the management of working capital requirements. In 2017, 29.3% of B2B sales in France were made on credit, far less than the regional average of 38.9%. This is similar to what was observed last year. Commodity price increases have added pressure on many food manufacturers, stuck between farmers demanding higher prices and powerful retail chains. The global economy is in a sweet spot of broad-based economic growth and low interest rates, but we expect this to be bottoming out in 2018.